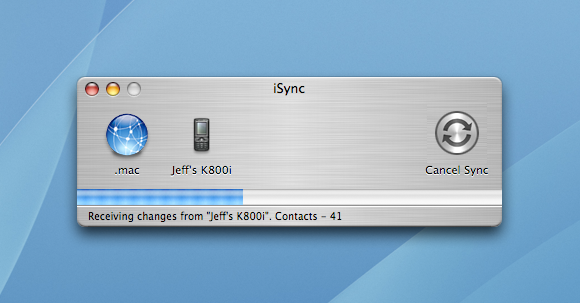 Even before Bluetooth came along, syncing cell phones and PDAs to your Mac was a piece of cake, thanks to iSync. A couple of weeks ago, when I was confessing my shameful love for brushed metal, I was reminded of one of my favorite and least-celebrated apps from the Mac’s history: iSync. 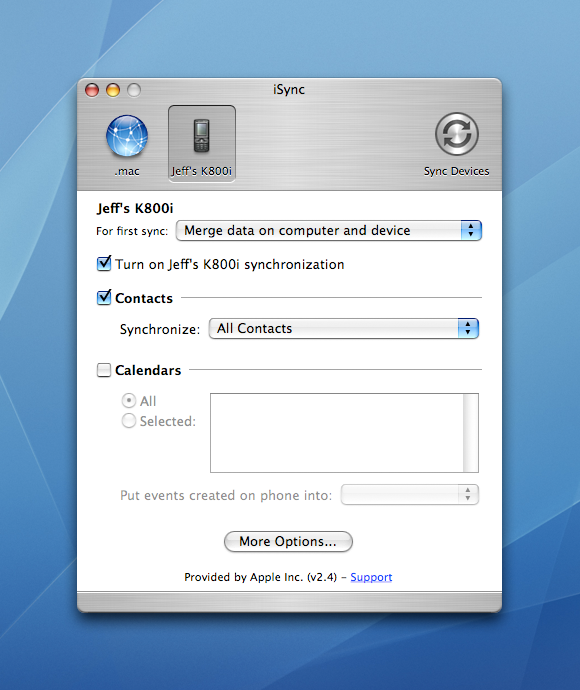 It first appeared in Mac OS X 10.2, and its job was to allow you to sync contacts and calendars to and from your Mac and a range of cell phones and PDAs from third parties, as well as Apple’s own iPods. This does not, I know, sound like a piece of software that it should be possible to get misty-eyed over, but I suspect that there are more than a few people reading who have just done the mental equivalent of letting out a wistful sigh. It’s a purely personal thing, but I’ve never liked installing third party software on my Macs. Oh, I don’t mean big applications like Photoshop or Office (although…), but rather little system hacks or anything that works at a vaguely low level in the system. Drivers, apps to control hardware, little things that power-up or extend the Finder, anything that requires a kernel extension, that class of software. It just feels like it’s clogging my Mac up with stuff, and it’s stuff, moreover, that’s often poorly designed and maintained, and which feels like an interloper on the Mac. So when iSync came along—something that sat right at the heart of the OS and talked, via the open SyncML standard, to many different devices from many different manufacturers—I was delighted. I felt confident with an app from Apple controlling this important data—even if, ahem, the core technology was actually licensed from FusionOne—and it meant that not only could I use a single, familiar app to control syncing data as I upgraded my cell phones, but that I didn’t have nasty debris from, say, a Sony Ericsson sync app still on my Mac if I then switched to a Motorola phone. It was easy to sync all or a subset of your contacts and events to each mobile device using iSync, and I don’t remember any syncing conflicts being thrown up that its conflict resolution handler couldn’t resolve. And it was especially exciting—for a given value of “exciting,” I’ll grant you—when you didn’t have just one device added to the sync list. As a recent graduate starting my first job at MacUser magazine in London in 2002, I felt terribly suave to have not just a mobile phone but my beloved Palm m500, and it gave me that special kind of tingle you get when you’re doing something novel and useful with tech when I’d have all my meetings and contacts synced easily between my Mac, phone, PDA, and even Apple’s nascent cloud services platform with a single click. 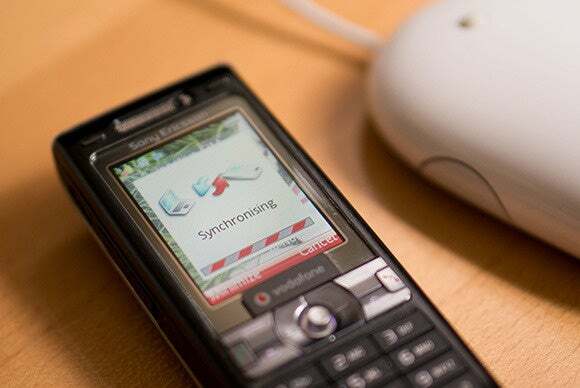 The link up with Palm’s HotSync engine was a little kludgy, to be sure, and in this case you really did have to have the dedicated software for the hardware installed as well as relying on iSync. But it was still fantastic to have your Mac at the center of the constellation of third-party devices, making them all get along with and talk to each other better than a $500-an-hour marriage counselor. Indeed, this was roughly when Bluetooth arrived, and if I had been able to retain my composure through all the foregoing excitement, the fact that my phone could be on the desk beside my Mac, or even still in my pocket or satchel, but not physically tethered and yet still sync was quietly mind-blowing. Yes, there had been short-range peer-to-peer wireless standards before, such as infrared. But IR was fiddly, and since it required a line of sight, even though you didn’t physically have to connect any cables, there was still a sense that you were having to connect the two things together—you had to go through the same process as tethering two devices by a cable when linking two devices with IR, only missing out the last step of actually using a cable. A Bluetooth sync of your PIM data with iSync felt transparent and frictionless, and it was the first hint of the world we’re just on the brink of now, where everything’s always in sync, effortlessly. iSync supported a decent if not exhaustive list of cell phones too, and even if yours didn’t appear on the list, there were third-party plugins available. And even if that didn’t fit your needs, Apple actually made a tool available that would let you build your own. The writing was on the wall for iSync, though, with Mac OS X 10.4—with this release iSync became a kind of glorified front-end for the Sync Services framework rather than handling all the data juggling itself. This was the era when iTunes began its bloat. The user interface for syncing with an iPod got shifted from iSync to iTunes, and while both that and every other decision to bolt new functionality onto iTunes makes sense in isolation, the aggregate effect, as we know, is the messy and flabby app we see today. But while today we rail against the bloat of iTunes—its jack-of-all-trades, master-of-none schtick—it turns out Apple has already once proved to itself you don’t need a single ravening behemoth of an app to gobble up any tangentially related duties. iTunes and iSync perfectly complemented each other back in the day, each doing its task well and efficiently. Apple is notoriously reluctant to look to its past, preferring instead to focus on the future. Perhaps with iTunes, though, it could draw inspiration for its future from its past. 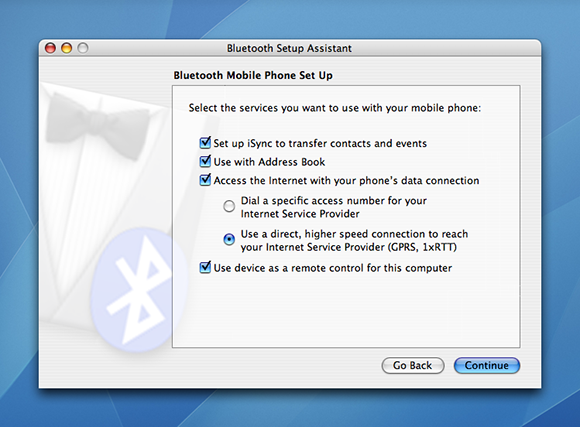 Postscript: I’d forgotten till I unearthed an old mobile and bought a Bluetooth dongle on eBay to get iSync running again on my iMac G4 that one of the things you were prompted to do when pairing some cell phones was to use them as remote controls for the Mac. That was fab! And do you remember being able to send and receive SMS messages directly from your Mac, long before Continuity and Messages?